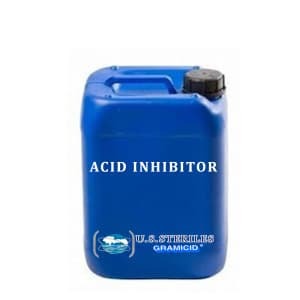 Acid Inhibitor, manufactured by U.S.STERILES is formulated product that helps in the prevention of the environmental acid attack on metal components without hampering the acidic effect or in some occasions even enhancing the acid effect in the given process or application. COROCEASE-1: Inhibitor for Hydrochloric acid / Hydrofluoric acid. COROCEASE-2: Inhibitor for Sulfuric acid, Phosphoric acid, Acetic acid, Sulphamic, Citric and oxalic acid. COROCEASE-3: Non Foaming Liquid Inhibitor for continuous strips pickling for Hydrochloric acid. COROCEASE-4: Inhibitor for Mineral & Organic acid inhibitors for Phosphoric, Sulfuric, Sulphamic , Acetic, Formic, Citic, Bisulphate solution, mixture of these acids & conditionally for Hydrochloric acid. These chemical additives are applied by dip, spray or other coating methods to protect metal components and equipment from the corrosive action of a direct contact or environmental acid. The concentration and type acid inhibitor needed is determined by the type of metal to be protected and the conditions experienced by the metal. Available in packing of 30 kg and 50 Kg.